The Universal Church celebrates the liturgical feast of Our Lady of Sorrows on the 15th of September, the day after the Feast of the Exaltation of the Cross. However an ancient tradition introduced into our islands during Aragonese rule commemorates the seven sorrows of the Blessed Virgin on the Friday preceding Good Friday and Holy Week. 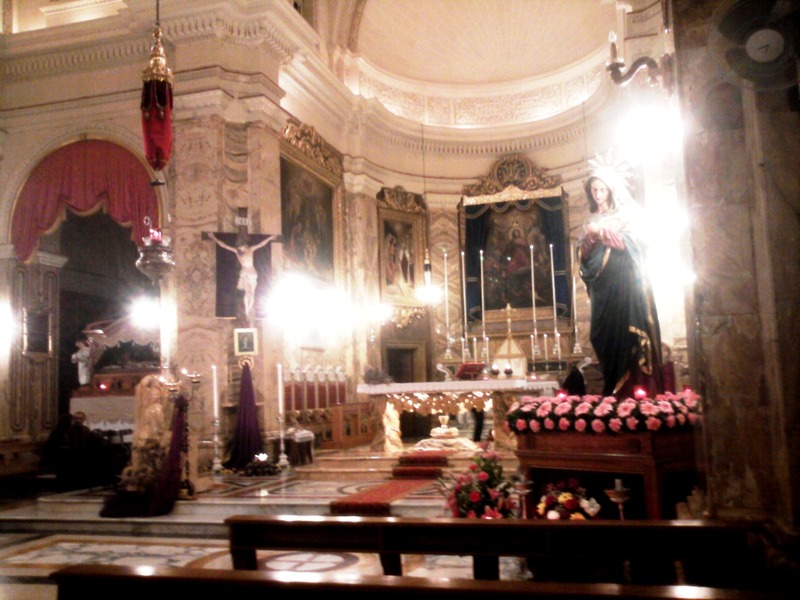 In our parish, the statue of the Virgin Mary of Sorrows was sculpted in papier-mâché by renowned Gozitan artist Wistin Camilleri in 1919 and was paid for by benefactor Mikiel Galea. It was restored twice; in 1966 and in 1991. The Santa Marija Band of the locality accompanied the procession with the statue which marched through Ghajn Mhelhel Street, Zaki Street, Skapuccina Street, Ghazziela Street and Madonna tac-Cicri Street. At the end of the procession during which the Rosary and the Via Matris were said, the Via Crucis was prayed in church and Benediction followed. Mass was at 7.00 pm during which Deacon Mark Bonello delivered the homily about the Christian meaning of suffering. The choir of the parish sung during Mass; Franco Cefai’s new Kyrie Eleison and executed. During communion, the new Innu lil Sidtna Marija tad-Duluri, lyrics by Fr. Geoffrey G. Attard and music by Franco Cefai was sung for the first time. Then, Giulio Caccini’s magnificent Ave Maria was sung with Jacqueline Vella interpreting the solo in an excellent way attracting the admiration of all those present and echoing Andrea Bocelli’s classical interpretation of the composition.